Went to a press preview of the Camille Silvy exhibition at the National Portrait Gallery. Silvy was a French pioneer of photography in the 19th century, working on both sides of the channel in the period before anybody had a clear idea of how you might make a living out of the new art. There are entire folders of all the people he took pictures of in his London studio, from memorial pictures of dead infants through famous writers to would-be society figures. Included among them is this arresting picture from 1862 of James and Sarah Davies. 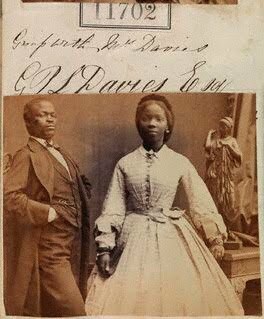 She was a present from the King of Dahomey to the Queen of England via a sea captain. There's more of the story here. Where's the 6 Music of talk radio? Has Blue Peter made children out of us?